The 2018 Lenovo ThinkPad X1 Yoga is a fine business tool if you seek speed, flexibility, and comfort in portable computing. It’s expensive, but makes itself worth considering if your shortlist contains the likes of the Microsoft Surface Pro and even the Mac. If you already use last year’s ThinkPad X1 Yoga though, and are contemplating upgrading, kindly walk away from this review. Year after year, Lenovo continues to run with the innovation torch IBM handed to it thirteen years ago. While it has managed to run with the torch still blazing bright during some years, it has let the flame diminish during some others. 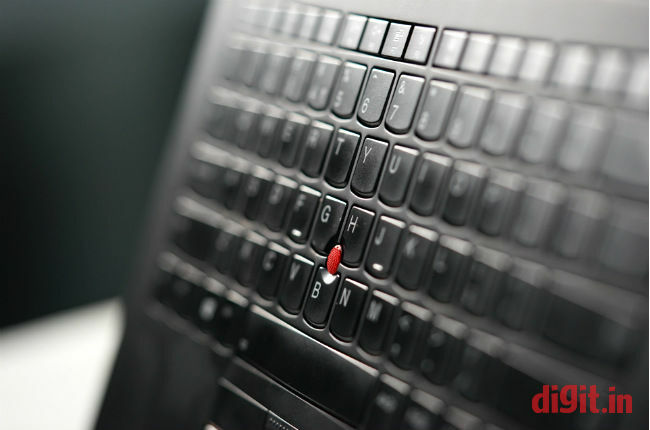 The redesigned six-row chiclet-style ThinkPad keyboard, despite the onslaught of many purists, proved to be a more compact replacement for the aging seven-row keyboard while still maintaining the same feel and comfort. Lenovo’s Power Bridge technology showed us we could finally swap batteries on a laptop without shutting it down. The displays on ThinkPads too improved manyfold under Lenovo’s watch. What about this year? 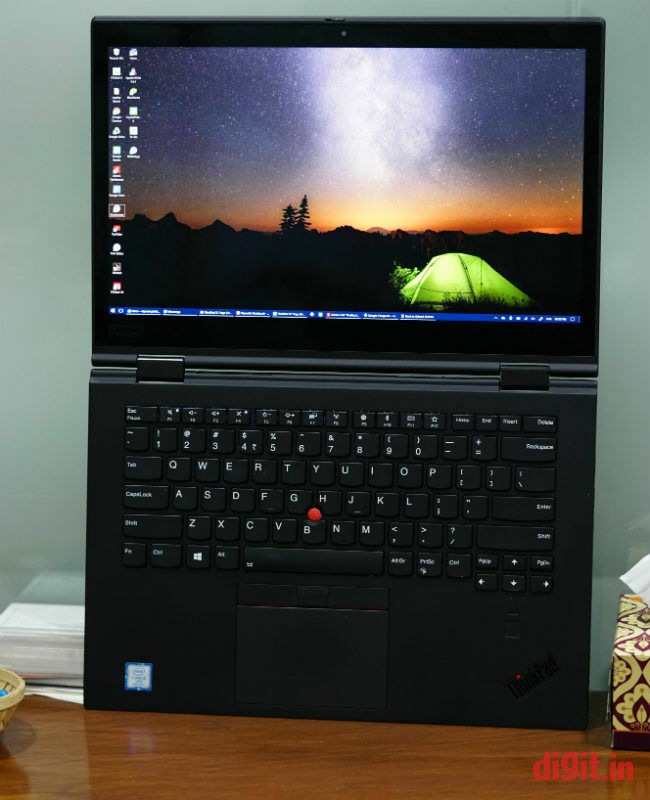 Today I’ve got in front of me the third-generation Lenovo ThinkPad X1 Yoga, a convertible business laptop that looks exactly like the second-generation X1 Yoga. I’m wondering, has Lenovo thrown in something special this year or has it just played pitstop for spec changes? I’m raring to find out! The model I’ve got with me here has an eighth-generation Intel Core i5 vPro processor, 16GB of RAM, and 512GB of SSD-based storage. The display on it is a 14-inch WQHD IPS touchscreen panel. In its signature matte black colour, the device looks rugged, understated, and full of promise. 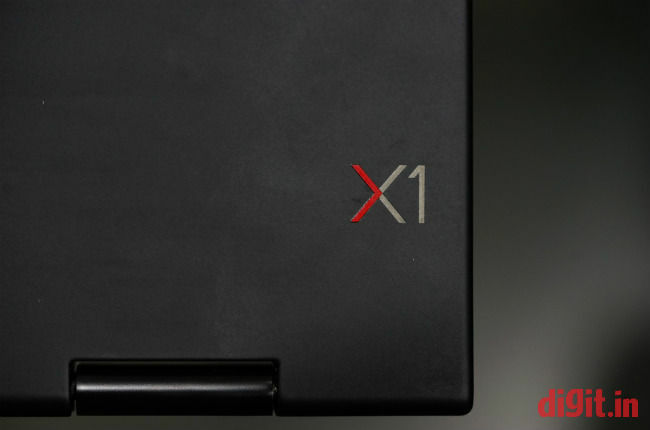 The body of the ThinkPad X1 Yoga is made of a hybrid carbon fiber material. It feels durable and looks premium. The ThinkPad logo has now turned black in colour, making the branding look even more subtle than before. The dual display hinges are made of an alloy and are designed to make the device open all the way back to its ‘Yoga’ positions. 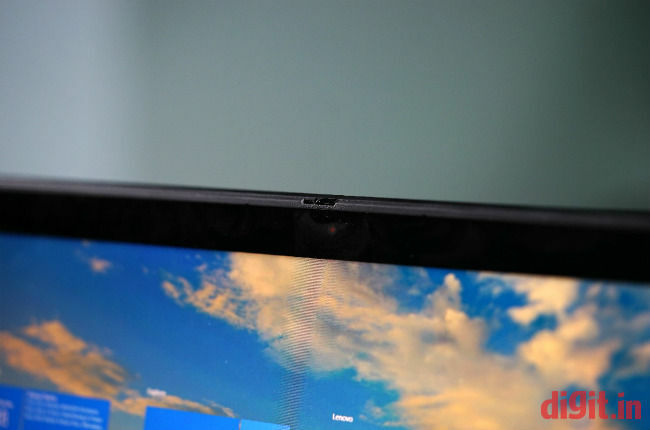 A thick glossy black bezel runs around the display, featuring a nearly invisible Lenovo branding. The material around the keyboard seems to be made of soft plastic and matches the rest of the body in colour and texture. Save for a few grilles at the bottom (for heat and speaker housing), the base is bare. Long-time users of the ThinkPad will notice the absence of the docking port, something Lenovo has stopped using for some time now. In terms of dimensions and overall design, the third-generation ThinkPad X1 Yoga is a blatant facsimile of the second-generation model, and that’s not always a bad thing, given it was a clever and reliable design to start with. You’d be hard-pressed to tell the difference between last year’s model and this year’s unless you’ve studied the differences carefully. Apart from subtler branding, the surface around the keyboard and touchpad loses the four tiny rubber nubs for the display. The dimensions of the laptop remain the same as the previous model. The fingerprint sensor below the keyboard may look the same as last year’s but employs a match-in-sensor technology, by which fingerprint verification is done within the sensor instead of exposing it to the vulnerabilities of the operating system. In my experience, I’d say the fingerprint sensor was generally slow to respond. Unlike last year’s model which included an OLED option, this year’s ThinkPad X1 Yoga offers only 14-inch touchscreen LCD options: one FHD-resolution (1920 x 1080 pixels) IPS panel with a max brightness of 270 nits, and two WQHD (2560 x 1440 pixels) IPS panels—one with Dolby Vision and one without. Appearing on a ThinkPad for the first time, Dolby Vision brings support for HDR and has a max brightness of 500 nits. The model in review has the WQHD-resolution display, but no Dolby Vision. The display, even with its 270 nits of brightness, is exceptionally bright indoors and outdoors. Colours, however, are excessively saturated. The display is glossy and reflective, but isn’t a big distraction even when there are other overpowering lights around. Text is readable even when the display is popped all the way down. Sticking to the ‘Yoga’ promise, the display folds all the way back to meet the base. The touchscreen display responds well to even the slightest of touches. This model includes an automatic brightness feature, which I found to be too erratic for my taste; it would change display brightness every few seconds, making reading an absolute pain. Audio output from the ThinkPad X1 Yoga’s speakers is clear and loud when placed on a table inside a quiet 15 feet x 15 feet room. Understandably, it lacks bass. Buyers of this model should be entitled to a month’s trial of Dolby Atmos, which is available as a Windows Store app on Windows 10. On USB headphones, Dolby Atmos’ virtual surround effects are clearly apparent, but on earphones, not so much. Ports on the left and right sides of the ThinkPad X1 Yoga remain the same as last year’s, save for the removal of one full-size USB port from the left side of the laptop. This removal comes as a puzzling surprise to me, especially since the thickness of the laptop (or its dimensions in general) has not changed at all. We still get one full-size USB port and two Thunderbolt 3 ports on the left; one of them gets eaten up for powering the device. On the right, we have a full-size HDMI port, DisplayPort, a single 3.5mm audio jack for headsets, a Kensington lock, and another full-size USB port. On the back, there’s a microSD card slot and a micro SIM card slot. Camera options include a regular 720p sensor and a Windows Hello-supported IR camera. The latter however, does not get the ThinkShutter. The keyboard is this ThinkPad’s biggest party trick. 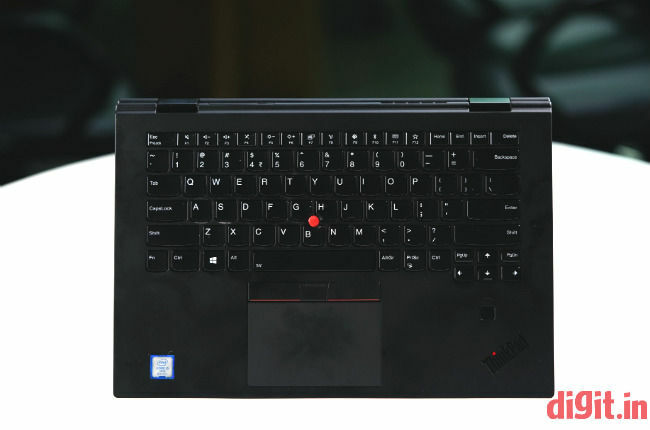 Named the ‘Rise and Fall’ keyboard, the keys on this keyboard operate like the keys of any other ThinkPad keyboard when the lid is open in laptop mode, but retract to sit flush with body when the lid is closed or opened out in tablet mode. This clever design relieves you of the feeling that you’re constantly pressing a key on the keyboard when using the device like a tablet. Key travel and feedback are excellent, as on any other ThinkPad keyboard. The keyboard has an automatic backlight that works well, but could’ve been a touch more sensitive to darkness. The touchpad on the ThinkPad X1 Yoga is a precision unit; it works perfectly without needing any third-party drivers. Apart from the left- and right-click buttons under the trackpad, there are three physical buttons above the trackpad, namely left-, right-, and middle-click buttons. The trusty TrackPoint is still around for those who prefer using it over the trackpad. Using these input methods was a smooth and pleasurable experience. The pen included with the ThinkPad, I’m sure would have been great—had it worked. Yes, the stylus pen, dubbed ‘Pen Pro’, simply refused to work on this device despite several attempts to get it working. I’m told a working pen has 2048 levels of pressure sensitivity and charges within the silo it sits in. It’s a shame I couldn’t test the writing aspect of the ThinkPad out. I would have had a chance to learn how it compares with the Microsoft Surface Pen. Palm rejection, on the other hand, seems to be very effective on this convertible laptop; it did not pick up any signals from my palm when I simulated writing with my finger. The fairly thick bezels around the sides also help in acting as a resting space for the user’s palm. As expected of a business laptop, the Lenovo ThinkPad X1 Yoga comes with CPU options as sophisticated as Intel Core i7 vPro. All processor options are Intel Core series CPUs of the latest eighth generation. They come in vPro variants as well, which means they will support Intel’s enterprise tools like Active Management Technology, allowing remote wipe and other security tasks. RAM options include 8GB and 16GB. Storage options are all SSD-based. The capacity varies from 128GB to 1TB. The base variant uses a SATA SSD, while the others use a faster M.2 PCIe NVMe SSD. The model in question today features an Intel Core i5-8350U vPro (clocking at 1.7GHz and going up to 3.6GHz with Turbo Boost), 16GB of RAM, and an Integrated Intel UHD Graphics 620 GPU. Storage is taken care of by a 512GB Toshiba M.2 single-sided PCIe NVMe SSD. Performance on the ThinkPad X1 Yoga was remarkably good. On benchmark tests like PCMark 8’s Accelerated Creative test, Conventional Work and Home tests, the X1 Yoga trumped the Microsoft Surface Pro by at least six hundred points. 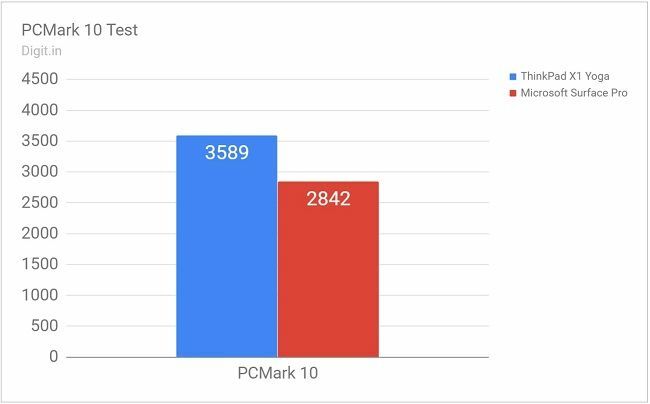 It, however, lost points in 3DMark’s graphic rendering tests because it had no dedicated graphics card. It’s for this reason as well that I didn’t try playing any games on the ThinkPad. In real world, the ThinkPad seemed to be always on its toes. Everyday applications like Chrome, iTunes, Word, and Excel launched after a cold boot opened in less than approximately four seconds. Subsequent launches were, naturally, faster still. Switching between twelve open applications across two different virtual desktops showed zero signs of lag. Chrome handled over thirty open tabs at the same time, without feeling the need to refresh any of the pages. Toggling through all the open tabs was also a smooth affair. The device switched to tablet mode accurately when folded with no pauses or stutters. It was only when the application count rose over twenty that I saw some stutter, but even that was only in animation and not in performance as such. Despite an average CPU package temperature reading of 65 degrees Celcius, heat is generally manageable on the ThinkPad X1 Yoga. There are times though, when the rise in temperatures becomes very apparent (especially during application installations), but it’s all felt in exactly one spot on the base of the laptop—bang in the middle of the laptop’s rear end. The integrated 54Whr Li-ion battery on the ThinkPad X1 Yoga scored 281 minutes on PCMark 8’s Creative Conventional Battery Life test, which is 8 minutes more than the score bagged by the Microsoft Surface Pro. It’s certainly a far cry from the lofty ‘up-to-15-hours’ figure Lenovo claims in the product’s website. In real-world usage, the ThinkPad lasts between 6 and 7 hours under the following conditions: display brightness set to about 65 percent, Wi-Fi and Bluetooth turned on, six applications running simultaneously (one being a browser and playing video in the background). In my opinion, it’s a bit low by ThinkPad standards, even if it is a slim Yoga model. The ThinkPad X1 Yoga features Rapid Charge. I saw the laptop charge from 10 percent to 90 percent in an impressive 70 minutes. The Lenovo ThinkPad X1 Yoga is a fine business tool that excels at performance, construction, flexibility, and comfort. However, it is all of the aforementioned only when it’s viewed as a completely new ThinkPad device in the market, but not when it is viewed alongside last year’s ThinkPad X1 Yoga. In other words, if you’re looking to spend upwards of a lakh and a half rupees on a fast and flexible convertible laptop, consider the ThinkPad X1 Yoga. It’s newer and better built than the Microsoft Surface Pro. 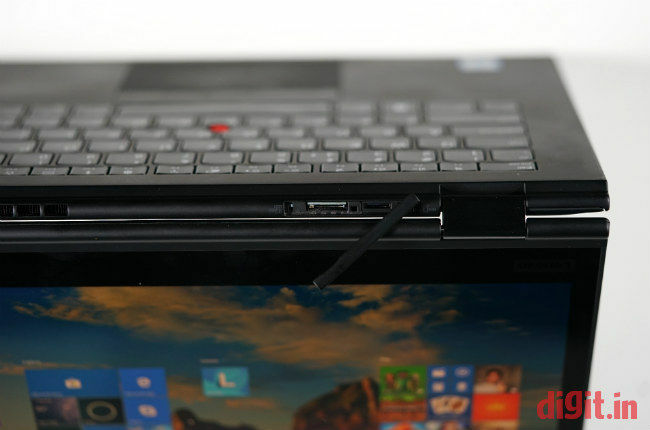 On the other hand, if you’re already a user of last year’s ThinkPad X1 Yoga, don’t bother; your upgrades can be taken care of by one tiny roll of adhesive tape. With Lenovo’s most recent innovation being an elegant replacement for a small piece of tape over the web camera, I ask myself sometimes if the Chinese electronics giant is still capable of wowing ThinkPad fans with something more extraordinary. Maybe it still is and maybe it was one of those years for Lenovo. Maybe the next model will be more than just a minor update. As always, time will tell.